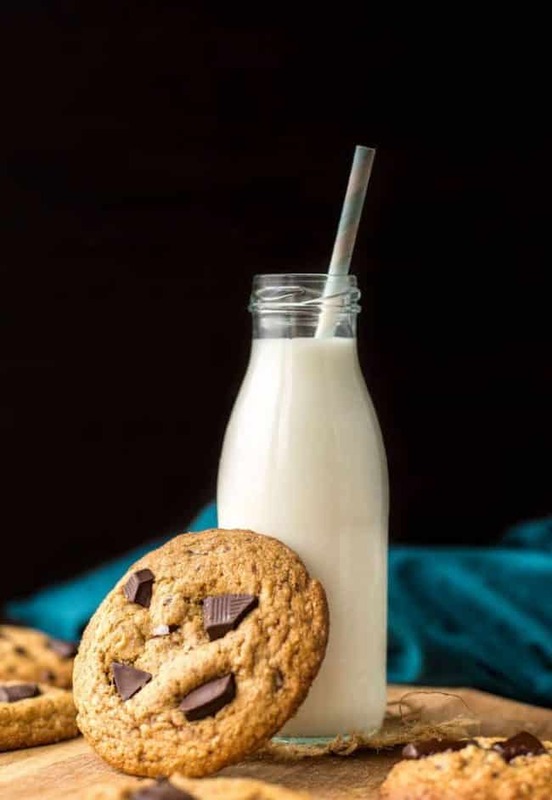 Sneaking in with one last recipe before Christmas – and what better recipe to share than these paleo chocolate chip cookies? I don’t have a lot of Christmas traditions that are set in stone, but one thing I have to do is bake a batch of chocolate chip cookies on Christmas Eve. It’s just necessary. 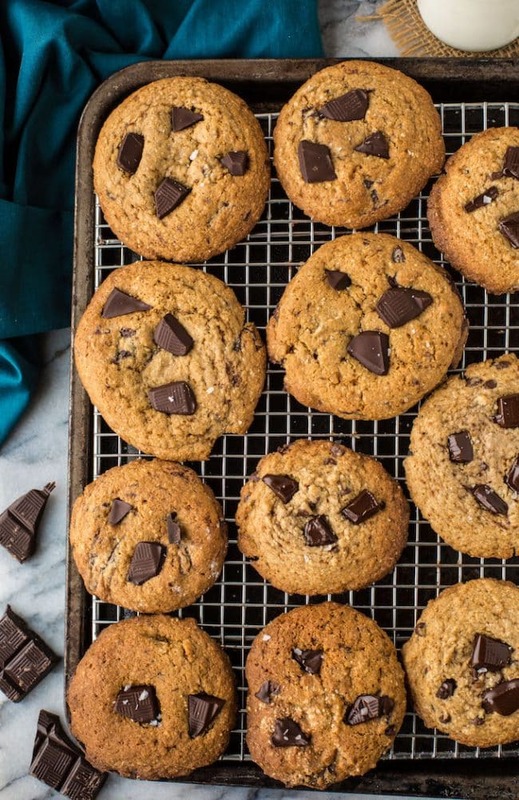 Last year we made chickpea flour chocolate chip cookies (which btw I still LOVE), but this year I’m making these babies. 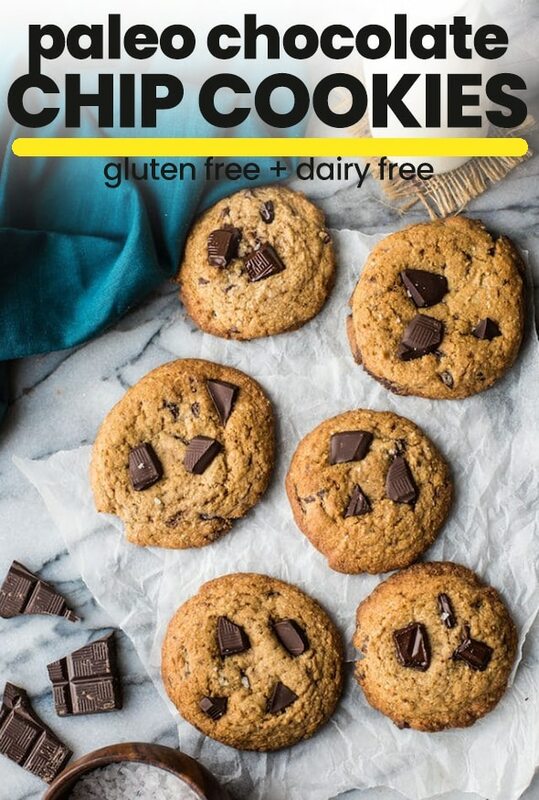 These cookies are made with a blend of three paleo flours: coconut, tapioca, and almond (<–affiliate links). It’s kind of like using an all purpose paleo flour blend in that the multiple flours are needed for a better balance of textures and taste. 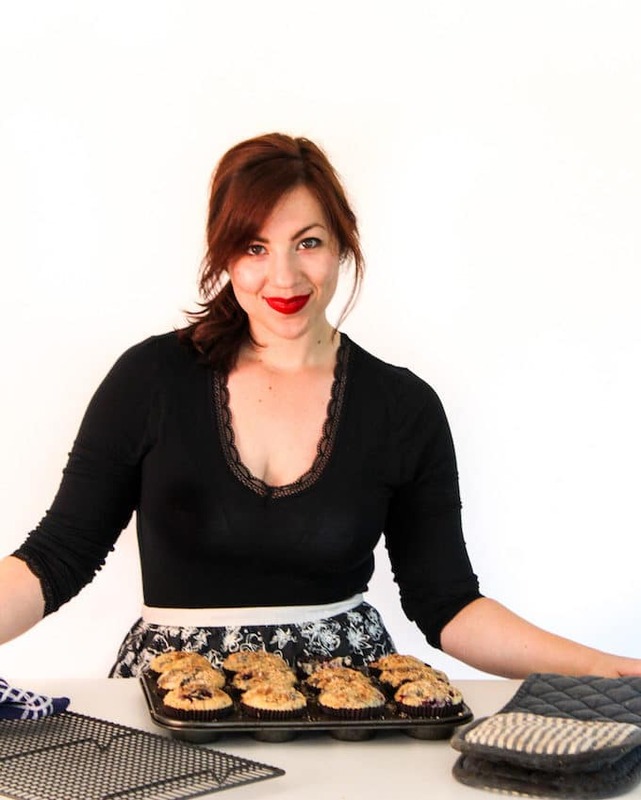 If you’re familiar with paleo baking/cooking they’re probably flours that you’ve got already. If you’re new to paleo baking however, they are probably flours that you’ll want to invest in as they end up used in a LOT of recipes. 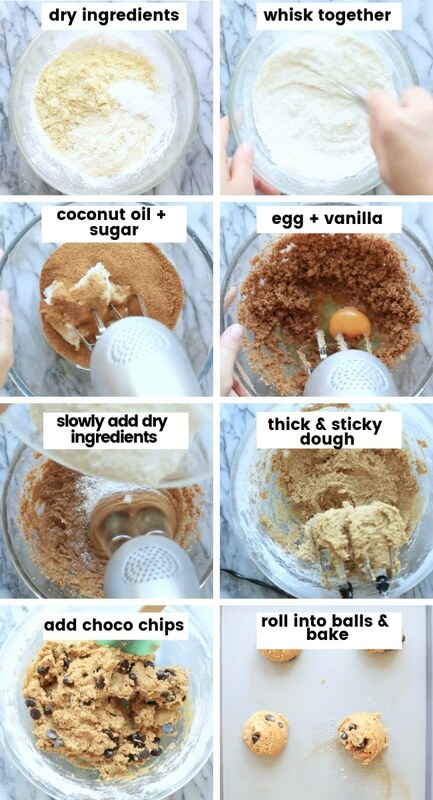 Making these cookies is really simple. Just whisk together most of your dry ingredients: the flours mentioned above along with baking soda + baking powder. Once the flours are well mixed, set aside and cream together your butter/oil, sugar, vanilla and egg. Once that mixture is nice and smooth you can start adding the flours to the current mix and stir until you’ve got cookie dough. 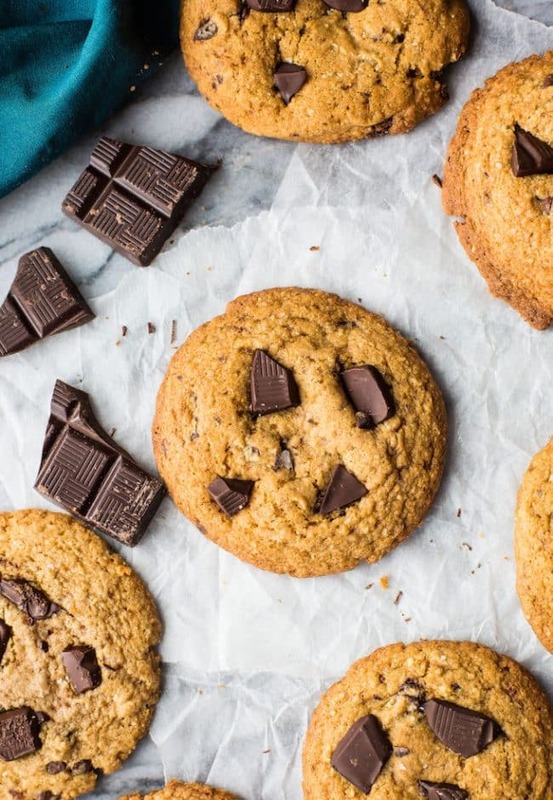 If you use coconut oil in these cookies to keep them dairy free, just make sure you let the dough chill in the fridge for about 20 minutes before baking. It doesn’t need long – just long enough for the softened oil to harden up before baking so that they don’t spread too much while baking. Once that’s done it’s just a matter of baking and waiting. Nothing too fancy or out of the ordinary here – just good old fashion cookies…paleo cookies, that is. In case you need a little more reason to love these let me paint a better picture here. Christmas or not – these cookies are perfect for any occasion! 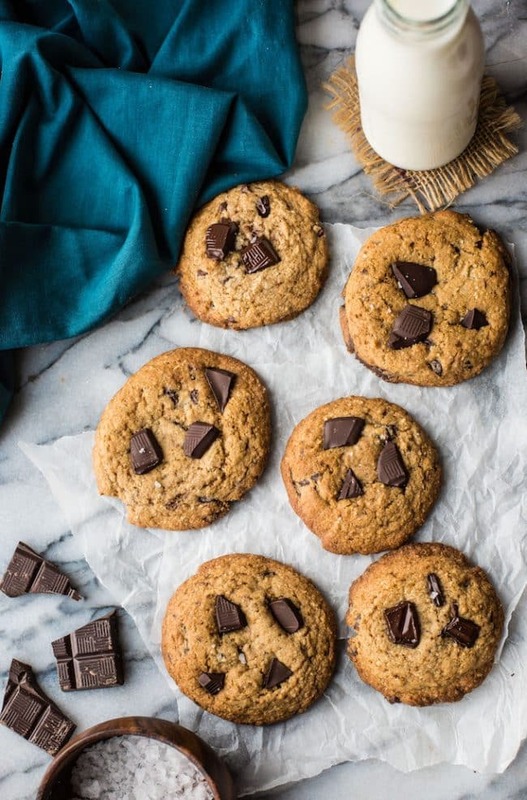 Don’t forget to #asaucykitchen on instagram if you try these Paleo Chocolate Chip Cookies! I’d love to see what you make with it! You can also post your pictures to my facebook page! In a mixing bowl whisk together your tapioca, almond and coconut flour with the baking soda and baking powder. Whisk until everything is fully mixed together. Set aside while you prep the wet ingredients. In another medium sized bowl beat together your coconut oil and sugar with an electric mixer. Add the egg and vanilla and continue beating until fully combined. Continue beating the sugar mixture on a low speed slowly adding in the flour mixture as you mix. Continue mixing and adding until everything is mixed together fully. Stir in your chocolate chunks, saving a few for pressing into the tops of the cookies later. Cover and refrigerate the dough for 20 minutes to let the coconut oil firm up. Coconut oil spreads a lot while baking so do not skip this step. If working with butter there's no need to refrigerate before baking. Preheat your oven to 350°F/175°C. Lightly grease or line a large cookie sheet. After the dough has chilled in the fridge scoop out 1 tablespoon sized balls and place on your prepared cookie sheets. Leave about 2 inches in between the cookies dough so they have room to spread. Bake for 8-10 minutes or until the edges are lightly golden. Remove from the oven and while they are still hot, press the left over chocolate pieces into the tops of the cookies. Let cool for 5 minutes on the cookie sheets before carefully transferring to a wire cooling rack. Let finishing cooling and enjoy! I took these into my work and they didn’t last long! Lots of positive feedback. Would it be possible to switch out egg for an egg replacement? One of my colleagues has an egg allergy so they couldn’t have one. Thank you. I’m so glad everyone liked them! I haven’t tried it myself yet but I do think that these would work if you use a flax/chia seed egg replacement (mix 1 tablespoons ground chia or flax seeds with 3 tablespoons water and set aside until it becomes a thick gel). I’ve been meaning to try that out myself so hopefully I can get back to you soon to say for sure! Thanks Natalie! Tapioca is one of my favourite gluten free flours – I use it in so many things and it adds such a nice texture to grain free baking. Hope you like them!